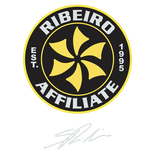 Douglas Santos is an IBJJF 4th Degree Black Belt, Founder and Director of DS Team BJJ (Brazilian Jiu Jitsu) and proud member of Ribeiro Jiu Jitsu. His career in the practice of BJJ spans over 30 years’, starting in his hometown of Florianopolis in Brazil, and continuing in Auckland since 2000. Genuinely committed and dedicated to the martial art Douglas launched the first ever BJJ School in New Zealand in 2000, growing the focus, dedication and participation in BJJ and expanding the academy and DS Team. It is one of the strongest teams in the country, holding 11 National team titles, 1 Auckland team title and many others in MMA and submission competitions. The DS Team is the only BJJ Academy in the world to have been visited by 4 BJJ superstars in the same year, including Clark Gracie, Xande Ribeiro, Marcus Almeida (Buchecha) and Rafael Lovato. With their in-depth knowledge and expertise of BJJ they delivered world-class training and seminars to the students of the DS Team, helping them to achieve their goals of developing their performance. The Academy’s number 1 goal is to provide training and support that makes our students Champions in Life. As a passionate mentor and trainer, Douglas has trained students to compete in competitions all over the world. He has been the Director of the World Pro trials in New Zealand, holding the rights or the World Cup trial over the past 6 years. He has also worked with the Auckland Blues and some of the All Blacks players, providing conditioning training and groundwork. Douglas has over 20 years of teaching experience and has created an academy that has students with enthusiasm and proficiency in the martial art, creating champions with the BJJ practice.